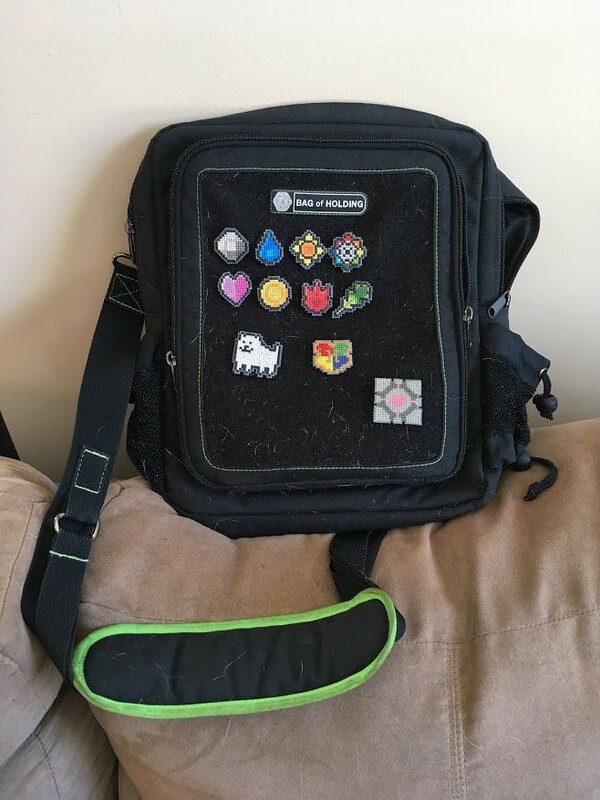 Last month, I wrote a couple of times about some bag badges I was making. Well, they’re done, and have been in the wild for about a week! I LOVE how they came out!! (Don’t tell the others, but these are my favorites 🙂 ) They’re directly based on the badge sprites from the original Pokemon Red/Blue. He makes a great guardian for my bag. Next was an obvious choice. I’ve made this little pattern before. Harry Potter is one of my favorite series of all time! The patterns are ones I found ages ago on SpriteStitch. I had a few Velcro dots left, so I decided to make a couple more badges for us. What better companion than a Companion Cube? So we each got one of those. All of the badges we backed with felt via ModPodge, and then sealed with ModPodge. I left the center of the felt backing unsealed to attach the Velcro. The Velcro I used were some ovals with sticky backs especially for fabric. And my ThinkGeek Bag of Holding! This isn’t an advert for them, but I seriously LOVE this bag. I carry my Surface and current project EVERYWHERE in it. It’s well loved. 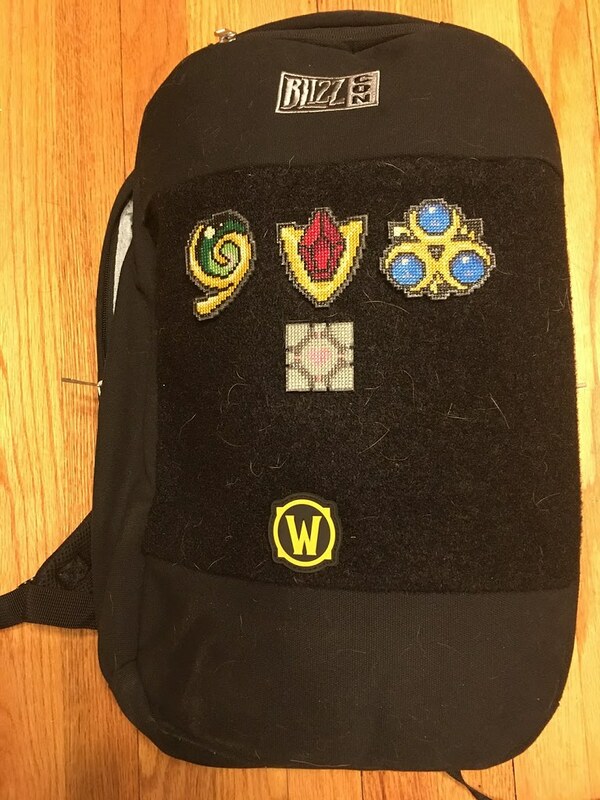 This entry was posted in Cross stitch and tagged dog, Harry Potter, oot, pokemon, portal, undertale, Zelda. Bookmark the permalink. 2 Responses to Bag Badges! oooohhhh…so you don’t stitch through the Velcro? I tried making some, but it killed my fingers trying to stitch through that crap. Hmmmmm…. Nope! I stitched on the plastic first, and then attached the Velcro. I imagine stitching on the Velcro itself wouldn’t be…super fun. You should try again! Good luck!